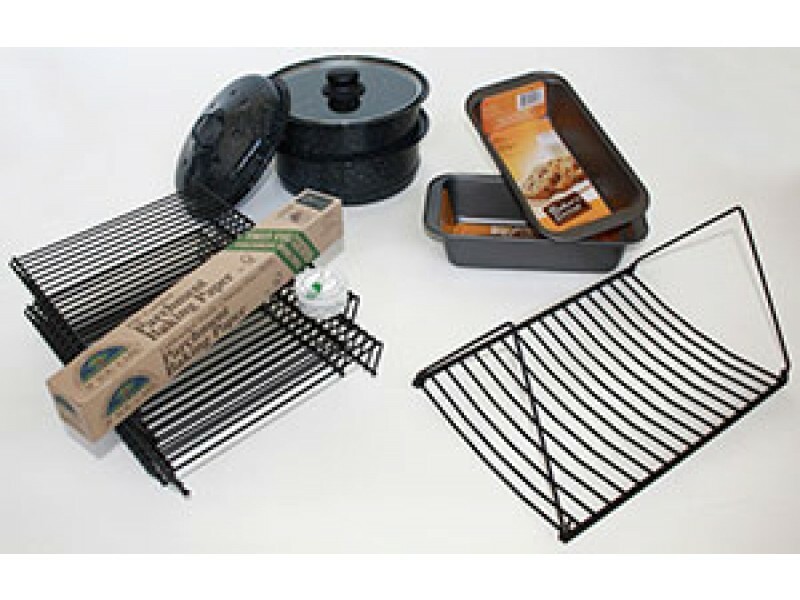 Buy Preparedness, Dehydrating & Turkey Roasting Package , from Sun Ovens International Inc for $92.99 only in My e-commerce. Multilevel dehydrating and baking rack set (3 wire racks and 1 roll of unbleached, silicone coated parchment paper) which allow for up to 3 layers of drying to occur at once with the Global Sun Oven. 2 Easy Stack Pots with interchangeable enamel and glass lids that feature a spill free cooking process while cooking multiple items. Can be locked together for cooking and are interchangeable. Multifuel water pasturization indicator (WAPI), which is a reusable thermometer which indicates when water is safe to consume. 2 Loaf Pans that are non-stick and can bake a variety of bread doughs.